ST. PAUL, MINNESOTA, February 24, 2015 — The in-store radio architecture is typically a patchwork of systems and components from different sources to deliver music and advertising to businesses, with challenging scenarios for licensing music and audio content. The formation of StoreStreams aims to simplify the launch and management of a multi-site in-store radio system, cleanly integrating IT network infrastructure with audio players—and providing the content, licensing and user interface to ensure a unified and profitable service. StoreStreams brings together the music catalog and network intelligence of XYZ Stream Hosting, a specialist in live, multiplatform content delivery; with end point hardware supplied through LineQ, a distributor specializing in networked AV equipment. LineQ will supply Ecler Sound amplifiers, Cornered Sound loudspeakers and media players from Barix, an IP audio pioneer with hundreds of thousands of hardware players in deployment worldwide. Furthermore, the service operates on a contract-free, month-to-month basis for maximum operational flexibility. The StoreStreams service will focus specifically on streaming content to network operators and retail businesses that want a wide selection of music channels, without the headaches of procuring and licensing content. A clean and intuitive interface will allow curators and program managers to build playlists and manage content with ease. Included within the management application is the ability to structure and schedule ad placement, station ID’s and promotional material. For resellers and integrators, the complete integrated package minimizes components and eliminates installation headaches, further accelerating deployments. Perhaps above all, the reliability of the cloud-based, redundant streaming architecture will ensure a live, branded streaming service with high availability for networks of any scale—ensuring a dynamic, high-quality and uninterrupted in-store radio experience. Will Schmidt, vice president of sales for LineQ, adds that packaging the content and licensing into an integrated solution with streaming, content management, and end point tools also makes StoreStreams an ideal platform for content curators. By including content and licensing, curators can manage audio programming for retail businesses without getting involved in the legal aspects of the in-store media business. LineQ is currently offering six months of free service with the purchase of an endpoint device, such as the Barix Exstreamer—the device that receives, decodes and plays out audio content inside stores. The complete solution will be available by end of February. StoreStreams is the turnkey in-store audio solution that integrates seamlessly within retail environments, providing access to a wide-ranging music catalog that complements the atmosphere of any business. Founded by musicians and music lovers, StoreStreams creates customized, branded radio channels that remove the elevator music stigma, and is driven by technology that ensures the highest quality sound. 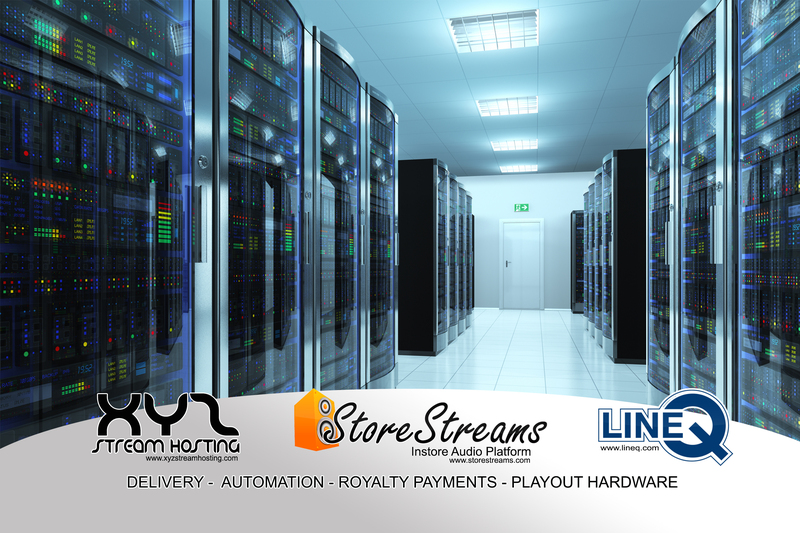 StoreStreams also ensures the highest possible uptime for live streaming services without interruption through its regionalized, redundant server environments, offering reliable and scalable services for both the single retail storefront and large business networks with thousands of locations. Please respond with Unsubscribe in the Subject Line if you prefer to no longer receive press releases.